Not since 2002 have all the recipients of the Canada Gairdner International Award in a single year been recognized for their roles in the same advance. Back then, it was for sequencing the human genome. This time it's for CRISPR (pronounced "crisper"), an acronym that is associated with a fast and precise way of searching and slicing DNA that offers scientists unprecedented control over the genetic code of any cell or species. The award is the latest – and among the most respected – in a growing series of accolades marking CRISPR's remarkable rise. It could presage a Nobel Prize for some of those named on Wednesday by the Gairdner Foundation. It will also undoubtedly draw even more attention to the question of who deserves to be credited for the discovery and who has been left out, as well as the bitter patent dispute over who owns the right to license the technology and the overarching ethical conundrums that swirl around it. Two additional awards, one for advancing global health and one for Canadian leadership in medical science, were also announced by the foundation, both in connection with research related to understanding and combatting the HIV pandemic. Read Andre Picard's report on Dr. Anthony Fauci and Dr. Frank Plummer. Once in a while, a scientific discovery is so far ahead of its time that it takes decades for the world to catch up and understand its full import. The gene editing tool called CRISPR is not that kind of discovery. Instead, it is an idea that arrived at just the moment when the research community was ready to run with it. The result has been a whirlwind of advances that looks like it is just getting started. Since Francis Crick and James Watson discovered the DNA double helix more than 60 years ago, scientists have been learning to read and understand nature's ancestral code with increasing sophistication and speed. The result has been the emergence of vast libraries of genetic data that are providing astonishing insights into the basic machinery of living cells and the causes of disease. Now comes CRISPR – a handy tool, taken from the the world of bacteria and repurposed by scientists – that transforms the venerable book of life into a digital document where individual genes can be searched out and eliminated or replaced with lightning speed. It's not that scientists could not alter genes before now. But the job was like having to design and build a large and cumbersome machine for every single cut. Working with CRISPR is like being handed a pair of scissors. It's a single all-purpose tool that can cut DNA to suit, thereby turning a task that once took months or years into something that can be accomplished in hours. That is why the term CRISPR is probably on its way to becoming part of everyday speech – and why bioethicists say everyone should be paying attention. "This is a once-in-a-generation kind of discovery," said John Dirks, scientific director of the Toronto-based Gairdner Foundation. "It sort of changes everything." The five scientists the foundation has named as the latest winners of the Canada Gairdner International Award demonstrate just how fast that change has come, Dr. Dirks said. Ranging in age from 34 to 52, they are a stunningly young cohort for such a high-level award. The work they are being recognized for was published within the past 10 years – some of it less than three years ago. Yet it rests on a firm foundation of molecular and microbiology that leaves no doubt about its veracity or the astonishing possibilities it brings. Even a bare-bones account of who discovered CRISPR and harnessed it for gene editing could easily involve the names more than two dozen scientists from around the world. This is the quandary for awards committees now seeking to recognize what is unquestionably a major advance. Some of the hints that would lead to CRISPR were spotted as far back as the 1980s, but it was the growth of genetic sequencing that by 2000 allowed scientists to realize that many bacteria carry repeating sections in their DNA that are separated at regular intervals. These were dubbed clustered regularly interspaced short palindromic repeats, now simply abbreviated as CRISPR. At first, it was far from clear what these repeating bits of DNA were for until various labs in 2005 noticed that the spaces between them seemed to contain DNA copied from viruses. This suggested that somehow the repeats along with the viral DNA and some other related genes found nearby were all somehow part of a microbial immune system that equipped bacteria to remember what harmful viruses to guard against. By then, Philippe Horvath, a French scientist working for the dairy company Danisco, had become interested in CRISPR sequences in Streptococcus thermophilus, a species of bacteria that is important in yogurt production. "At that time I was working on methods to differentiate strains of the same species, which is not trivial in bacteria," said Dr. Horvath. He was thinking, at first, merely to use the CRISPR sequences as an identifier, like a set of fingerprints. But the idea that CRISPR might help beneficial bacteria fight off viruses — a key problem in the dairy industry — made the subject even more interesting. He enlisted a U.S. based colleague, Rodolphe Barrangou, among others, and they devised a series of experiments that turned out to have implications well beyond yoghurt. A key player at this stage was Sylvain Moineau of Laval University in Quebec, an expert in viruses that infect bacteria who had previously worked with Danisco. Collectively, the team proved that each CRISPR sequence makes bacteria immune to a different strain of virus and that this immunity is disabled when the CRISPR sequence is removed. The work was published in 2007 in the journal Science and would set the stage for a complete understanding of how the CRISPR system works. It is for this work that Dr. Horvath and Dr. Barrangou are receiving the Gairdner Award. Dr. Moineau is one of several scientists who are closely linked to the CRISPR story, but who have largely not been recognized with major awards. As many other teams joined in the effort to understand CRISPR, it gradually became apparent that the system worked because it did two things: It could search through a strand of viral DNA to find a telltale sequence that revealed the identity of the virus. It then cut the DNA at that same point, thereby disabling the virus. To achieve this feat, the system relies on two components. RNA, the single stranded counterpart to DNA, is copied from the CRISPR sequence and it carries the information needed to identify a virus. But to achieve this it first has to be combined with a CRISPR-associated (Cas) protein. Together, the CRISPR-Cas complex is built to seek and destroy the DNA of invading viruses. Jennifer Doudna, a prominent RNA researcher at the University of California, Berkeley, was among those interested in the details of how CRISPR-Cas complexes work. At a conference in 2011, she met Emmanuelle Charpentier, a French researcher working in Sweden who was working with Streptococcus pyogenes, the bacterium that causes flesh-eating disease. It uses a streamlined CRISPR system involving just one protein, encoded in a gene called Cas9. Dr. Doudna and Dr. Charpentier decided to join forces and together with several researchers in both their labs worked out precisely how the CRISPR-Cas9 system finds and cuts DNA. Armed with this knowledge, they then took the bold step of reprogramming the system. By adding their own made-to-order strand of RNA to the Cas9 protein, they found that they could get it to cut any strand of DNA they desired. They published their joint effort in a 2012 paper that cements their role in the CRISPR revolution and wins a Gairdner Award for each. At the same time, Feng Zhang, a neuroscientist at the Massachusetts Institute of Technology, was busy with his own project. Starting in 2011, he had become fascinated with the CRISPR-Cas9 system and within a year was finding ways to improve it for precision editing of mammalian DNA, using both mouse and human DNA as a model. In the fall of 2013, Dr. Zhang and his collaborators published their recipe for turning CRISPR-Cas9 into a powerful gene editor – one that can be used to silence several genes at once, which is a huge boon to researchers studying complex diseases such as cancer. Still more tantalizing is the ability not only to cut genes but also to harness the cell's natural repair mechanisms to insert new genes into places where CRISPR has been used to cut. This creates the full genetic tool kit, the outcome that has earned Dr. Zhang the fifth Gairdner Award in the set. "CRISPR genome editing technology is a really powerful platform," said Dr. Zhang. "It think it will advance both our ability to understand disease and to develop treatments." It is hard to understate the impact of CRISPR. As a gene editor, it could eventually lead to the elimination of many forms of inherited disease, help counter antibiotic-resistant microbes, disable parasites and improve global food security, among other breakthroughs. But CRISPR's emergence comes hand in hand with a host of ethical questions because it opens the door – at least in principle – to genetically tailored organisms, including humans. Dr. Doudna said she has come to realize that the scientists involved in developing the technology need to be involved in the public conversation about its ethical use "I think having scientists engaged in that discussion will go a long way toward safeguarding the public's trust," she said. Chinese researchers have already demonstrated that CRISPR can be applied to human embryos. That means it could potentially be used someday to correct deleterious genes before birth. But what researchers are more interested in is finding ways to use to systems like CRISPR-Cas9 to correct for genetically based diseases in children and adults. The key challenge is delivering the CRISPR system to all the cells where they are needed. It is easy to foresee that CRISPR may eventually be used in conjunction with stem cells to regenerate tissue that has a genetic defence against some form of disease that was previously missing. Meanwhile, the institutions behind Dr. Charpentier, Dr. Doudna and Dr. Zhang are embroiled in a bitter patent fight that could be worth hundreds of millions of dollars as CRISPR-based therapies head to the clinic. But for an entire generation of scientists currently training in university laboratories around the globe, this could hardly be a more exciting time. In a few short years, CRISPR has become that rarest of things in science, a chance stone overturned that opens the door to limitless possibility. When scientists discovered that bacteria have evolved an elegant immune system for chopping up the DNA of attacking viruses, they soon found that they could turn it into a powerful tool for editing genomes – including human genomes – to their own specifications. 1. Many bacteria harbour recurring sequences in their DNA that are called clustered regularly interspaced short palindromic repeats – better known as CRISPRs (pronounced "crispers"). The repeats are all identical to each other and are separated by spacers. 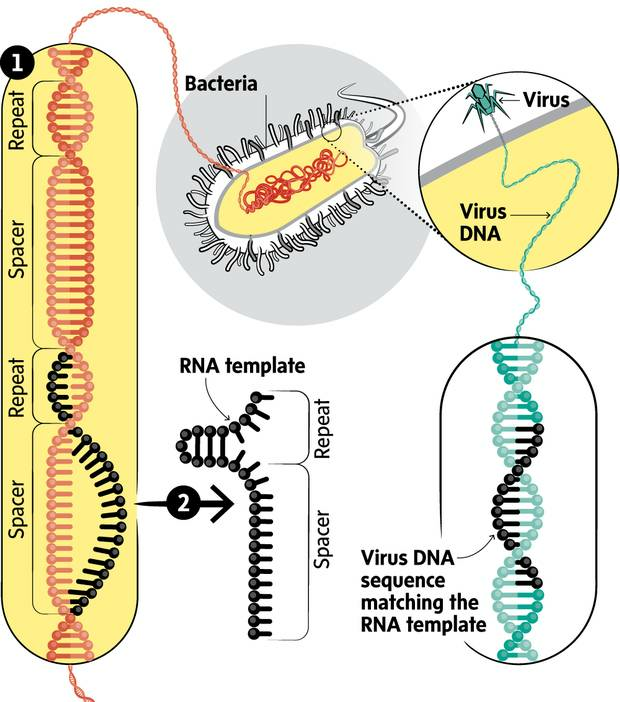 A spacer is a short segment of DNA copied from a virus. 2. Each repeat provides the blueprint for making a strand of RNA that folds up into a handle-like or hairpin shape. The neighbouring spacer makes a straight segment of RNA that trails from this structure and carries the unique identifier of a particular virus. 3. Another section of the bacterium's DNA provides the instructions for making a CRISPR-associated (Cas) protein or series of proteins. 4. The RNA and Cas protein fit together into a single complex. Once built, each CRISPR-Cas complex patrols inside the bacterium, where it may encounter DNA, including DNA from attacking viruses that have the matching sequence carried by the spacer. 5. At certain spots along a DNA double helix, a CRISPR-Cas complex can latch on and quickly unzip the DNA to look for a match. When a match is found, sections of the Cas protein close like scissor blades to cut both strands of the DNA. This destroys the virus DNA and stops it from replicating. 6. Once scientists realized how the system worked, they were able to adapt it into an all-purpose tool for cutting the DNA of any cell, including human cells. One version of the system, called CRISPR-Cas9, has proved especially fast and easy to work with. Scientists simply provide the Cas9 protein with a tailor-made RNA guide and then introduce it into a cell where it finds and cuts the cell's DNA at the desired spot. In this way, the system can be used to silence a gene or many genes by cutting the relevant regions of DNA. It's also possible to harness a cell's DNA repair machinery to insert a new gene that replaces one disrupted by the cut. 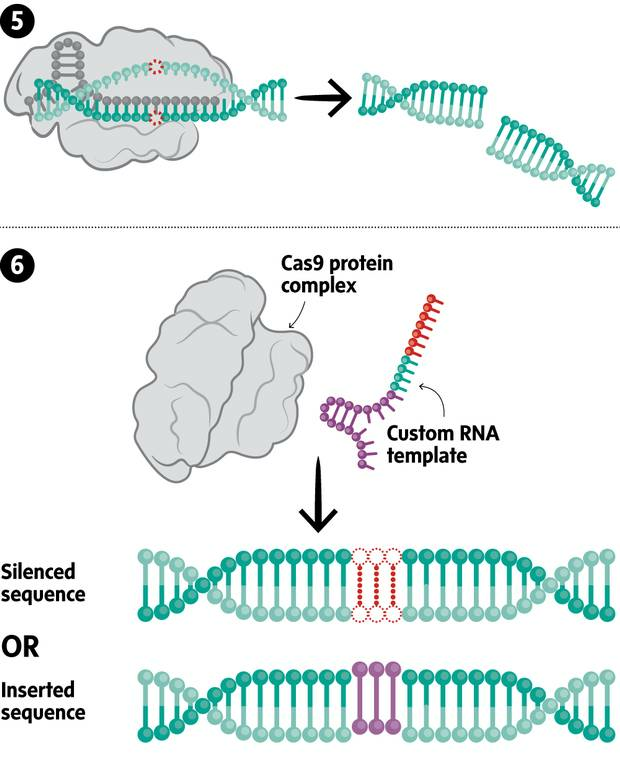 In this way, CRISPR/Cas9 can be used to edit any genome.